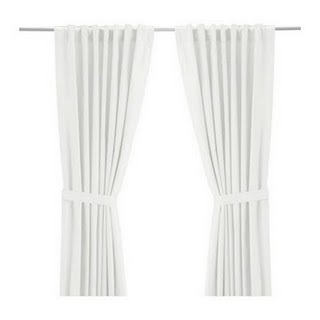 ﻿Long before we bought our home I purchased inexpensive white drapes from Ikea because I needed to cover my windows for cheap and I actually loved the way these pleated. I am not a fan of grommet or rod pocket drapes so these were perfect. Fast forward to present day and I have these in our Master Bedroom on 3 windows. I decided to kind of give them a bit of a facelift by lining them and adding pleater tape and hooks to give the triple pinch pleat look. This pleater tape is easy as pie and I have used it to make drapes in our guest room last year. So I bought the liner and supplies at Hancock (on sale! and I had to of been the youngest person in there) and got to work. Well apparently I am color blind and purchased off white liner and not white and didn't discover this till I had completed two out of the three. I was devastated. They looked yellow which clashed with my white homemade upholstered headboard. I can barely sew so I called my Mom and she came to the rescue and sewed all six panels for me in under 6 hours. It would have taken me multiple weekends if I had to do it alone. My job was to cut/ pin/ prep work. So a HUGE thank you to my Mom!